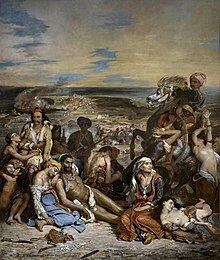 For the Delacroix painting, see The Massacre at Chios. The Chios massacre (in Greek: Η σφαγή της Χίου, Greek pronunciation: [i sfaˈʝi tis ˈçi.u]) was the killing of tens of thousands of Greeks on the island of Chios by Ottoman troops during the Greek War of Independence in 1824. Greeks from neighbouring islands had arrived on Chios and encouraged the Chians to join their revolt. In response, Ottoman troops landed on the island and killed thousands. The massacre of Christians provoked international outrage, and led to increasing support for the Greek cause worldwide. For over 2,000 years, Chios merchants and shipowners had been prominent in trade and diplomacy throughout the Black Sea, the Aegean, and the Mediterranean. The Ottoman Empire allowed Chios almost complete control over its own affairs as Chian trade and the very highly-valued mastic plant harvested only on Chios were of great value to it. The cosmopolitan Chians were also very prominent in Constantinople. Following the massacre, however, the island never regained its commercial prominence. The island's ruling classes were reluctant to join the Greek revolt, fearing the loss of their security and prosperity. Furthermore, they were aware that they were situated far too close to the Turkish heartland in Anatolia to be safe. At some points, Chios is only 6.7 kilometres (4.2 mi) from the Anatolian mainland. Georgios Stravelakis, a survivor, at the age of five, of the Massacre of Chios, was sold into slavery. He eventually became Prime Minister of Tunis, from 1837 to 1873. In March 1822, as the Greek revolt gathered strength on the mainland, several hundred armed Greeks from the neighbouring island of Samos landed in Chios. They attacked the Turks, who retreated to the citadel. Many islanders also decided to join the revolution. However, the vast majority of the population had by all accounts done nothing to provoke the reprisals, and had not joined other Greeks in their revolt against the Ottoman Empire. Reinforcements in the form of a Turkish fleet under the Kapudan Pasha Nasuhzade Ali Pasha arrived on the island on 22 March. They quickly pillaged and looted the town. On 31 March, orders were given to burn down the town, and over the next four months, an estimated 40,000 Turkish troops arrived. In addition to setting fires, the troops were ordered to kill all infants under three years old, all males 12 years and older, and all females 40 and older, except those willing to convert to Islam. Approximately three-quarters of the population of 120,000 were killed, enslaved or died of disease. It is estimated that 2,000 people remained on the island after 21,000 managed to flee, 52,000 were enslaved and 52,000 massacred. Tens of thousands of survivors dispersed throughout Europe and became part of the Chian Diaspora. Another source says that approximately 20,000 Chians were killed or starved to death. Some young Greeks enslaved during the massacre were adopted by wealthy Ottomans and converted to Islam. Some rose to levels of prominence in the Ottoman Empire, such as Georgios Stravelakis (later renamed Mustapha Khaznadar) and Ibrahim Edhem Pasha. There was outrage when the events were reported in Europe and French painter Eugène Delacroix created a painting depicting the events that occurred; his painting was named Scenes from the Massacres of Chios. In 2009, a copy of the painting was displayed in the local Byzantine museum on Chios. It was withdrawn from the museum on November 2009 in a "good faith initiative" for the improvement of Greek-Turkish relations. However, the Greek press protested its removal. The copy is now back on display in the museum. The Massacres of Chios Described in Contemporary Diplomatic Reports, edited and with an introduction by Philip P. Argenti (London: John Lane the Bodley Head Ltd., 1932). ^ Dadrian, Vahakn N. (1999). Warrant for Genocide: Key Elements of Turko-Armenian Conflict. New Brunswick: Transaction Publishers. p. 153. ISBN 1-56000-389-8. ^ a b c St. Clair, William (1972). That Greece Might Still Be Free, The Philhellenes in the War of Independence. London: Oxford University Press. p. 79. ISBN 0-19-215194-0. ^ Simon, Reeva S.; Mattar, Philip; Bulliet, Richard W. (1996). Encyclopedia of the Modern Middle East. Macmillan Reference USA. p. 1018. ISBN 0-02-897062-4. ^ Morsy, Magali (1984). North Africa, 1800-1900: A Survey from the Nile Valley to the Atlantic. Longman. p. 185. ISBN 0-582-78377-1. ^ Shupp, Paul F. (1933). "Review: Argenti, Philip P. The Massacre of Chios". Journal of Modern History. 5 (3): 414. doi:10.1086/236057. JSTOR 1875872. ^ "Revolution – The massacre of the island of Chios". chioshistory.gr. Archived from the original on 2 October 2011. Retrieved 30 March 2011. ^ "Christopher A. Long – The Massacres Of Chios 1822 (2)". christopherlong.co.uk. ^ "The Chios Massacre Of 1822". Queens Gazette. ^ "Η Ιστορία της Χίου και τα Μεσαιωνικά Χωριά της". chioshistory.gr. Archived from the original on 2011-10-02. ^ Christopher Long (1998-1999): The Massacres of Chios, Events & Massacres of 1822. ^ Littell, Eliakim (October 1888). The Living Age. 179. The Living Age Co. p. 614. OCLC 10173561. ^ Klose, Fabian (2016). The Emergence of Humanitarian Intervention: Ideas and Practice... Clays. p. 175. ISBN 9781107075511. Retrieved 6 August 2017. ^ "Eπισκόπηση Τύπου". naftemporiki.gr. 8 November 2009. ^ Chios Complete Guide Archived 2009-08-29 at the Wayback Machine. Wikimedia Commons has media related to Scène des massacres de Scio. This page was last edited on 7 March 2019, at 07:59 (UTC).